If you don't have an account with a streaming music service these days, you simply aren't living your life right. Look, I don't care which service you choose -- Spotify, Apple Music, Tidal, or something else -- it is foolish to buy and download songs. If you are still buying CDs, you are probably beyond hope, but I digress. Streaming music is simply the best value in entertainment. For a small monthly fee, you get access to more music than you can possibly listen to in a single lifetime. YouTube Music is yet another streaming music service, although it is not as popular as, say, Spotify. Google seems intent on growing this eventual Play Music successor, and today, the company announces a huge new feature -- Sonos support. Yes, if you have both a paid YouTube Music account and a Sonos speaker, you can finally use them with each other. "YouTube Music just got a little bit louder! Beginning today, YouTube Music is now available to play on all Sonos speakers. 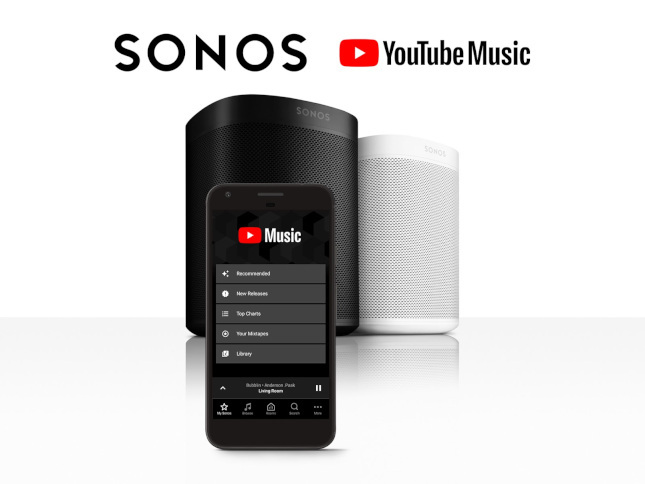 Through the Sonos app, fans around the world with a YouTube Music Premium or YouTube Premium subscription can now easily play official songs, albums, thousands of playlists, and artist radio -- on top of YouTube's tremendous catalog of remixes, live performances, covers that you can't find anywhere else," says Brandon Bilinski, Product Manager, YouTube Music. The Sonos app won't be a no-frills affair that only bridges the service to the hardware -- not at all. Actually, Google is creating a focused customer experience where you can access recommendations, personalized playlists, new releases, and, of course, your personal library. In other words, using YouTube Music and Sonos together should be quite welcoming and enjoyable. If you have a Sonos speaker but not YouTube music, you can sign up here. My recommendation would be to opt for the superior Spotify instead. In my experience, YouTube Music just isn't ready for prime time. With that said, Google is offering a one month free trial, so you can try it yourself rather than take my word for it. You might as well try it -- what do you have to lose?